Stability: Stable. Incompatible with strong oxidizing agents, strong acids. Light-sensitive. Combustible. Application It can be used as the dyes of silk, paper and acrylic as well as biological stains. It can be used for manufacturing paints and printing inks. It can also used as an acid-alkaline indicator with coloring range being from pH 0.5 (green) to 2.0 (blue), and developing reagent for colorimetric assays. It can form a colored chelate with thallium in the hydrobromic acid medium, thus it can be used as thallium sensitivity reagent. It can also be used for the determination of other metal ions such as zinc, antimony, titanium, cadmium, tungsten, gold, mercury and so on. It can also be used as biological stains and non-aqueous titration acid-base indicator. In addition, it can also be used as antiseptic for inhibiting Staphylococcus aureus, Streptococcus and some fungi. Its 1% aqueous solution is commonly known as "purple syrup" for the prevention and treatment of skin and mucous membrane infections. Its enteric-coated tablets can be used as orally anti-pinworm medicine. Description Anti-infective (topical). Has been used as anthelmintic (Nematodes), as indicator for copper salts. Uses As dye for wood, silk, paper; in inks; as biological stain. Preparation It is manufactured through using N, N-dimethylaniline as raw materials, followed by condensation, addition, chlorination and other reactions. 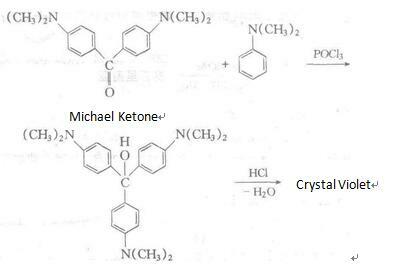 Alternatively, it can be synthesized through the reaction between Michler ketone and N, N-dimethylaniline reaction in the presence of phosphorus oxychloride, followed by azeotropic reaction with hydrochloric acid. Recrystallization in hot water will generate compound containing nine crystal water molecules. Brand name Genapax (Key); Gvs (Savage). General Description It belongs to triamino-triphenylmethane synthetic dyes; alkaline. It is an important dye used in bacterial Gram stain. The mixed reagent of crystal violet chloride and iodine is known as gentian violet. Description Crystal Violet is light sensitive. May react vigorously with strong oxidizing agents. May react exothermically with reducing agents to release gaseous hydrogen. Fire Hazard Flash point data for Crystal Violet are not available, however, Crystal Violet is probably combustible. Clinical Use Gentian violet is variously known as hexamethyl-p-rosanilinechloride, crystal violet, methyl violet, and methylrosanilinechloride. It occurs as a green powder or greenflakes with a metallic sheen. The compound is soluble inwater (1:35) and alcohol (1:10) but insoluble in nonpolar organicsolvents. Gentian violet is available in vaginal suppositoriesfor the treatment of yeast infections. It is also used asa 1% to 3% solution for the treatment of ringworm and yeastinfections. Gentian violet has also been used orally as an anthelminticfor strongyloidiasis (threadworm) and oxyuriasis. Safety Profile Poison by ingestion, intravenous, and intraperitoneal routes, An experimental teratogen. Other experimental reproductive effects. A human sktn irritant. Human mutation data reported. Questionable carcinogen with experimental carcinogenic data. When heated to decomposition it emits very toxic fumes of NO, and Cl-.